seen a tool like this and haven't yet figured out what it was used for. The other end was badly mushroomed indicating that whoever owned it had used it a lot. Just thought someone here might have seen these before. I don't know what it is. It sure looks sharp, as though maybe it was used on some non ferrous material. Looks as though it might have formed a louver or triangular tabs of sorts. It isn't scaled up, either. Makes me think it may not have been used on hot metal. I'd take a stack of cardboard and put a layer of tin foil between each layer and on the top - then give it a good whack. Might be a slit generator - the central area is untouched and the sides are spread out. For lashing down the metal struck to something ? In that picture, it has just been soaked in some acid to clean off the rust and wired brushed with an angle grinder. So if it looks too new and clean, that's probably why. The other end (the one you hit) was badly mushroomed (though in that picture, the struck end had been grounded clean so to remove the mushrooming). So whatever it was used for, it was being hit fairly hard (or just used for a very long time). But there was no real indication of damage on the working face. So it must have been used only on hot metal, or something else fairly soft. The angles are all 45 and 90 degrees. So if you made something like two square bars crossing each other, turned on the diagonal, this fuller would fit against one side of an intersection like that. I've never seen anyone forge a connection like that, but I guess it could be forge welded together, and then cleaned up with a tool like this one. The other possibility I guess, is that maybe only the two points are intended to be used as the working service of the tool. It could certainly be used to add evenly spaced texture marks using those points in a variety of ways. If you see the comments on facebook, Nol has said he believes it's for pointing a drill rod which he called a bull peen. I can't find any reference to what a bull peen is, nor does it really seem correct to me for that role. I've seen other drill rod tools that do look a bit like this one, but they are typically for pointing star drills. A flat drill with one blade would not be pointed very well by this tool as far as I can tell (and in fact, would not need a special tool at all for pointing it since it is just a simple taper). I've spent a lot of time searching the internet, and so far, I haven't found any clues. 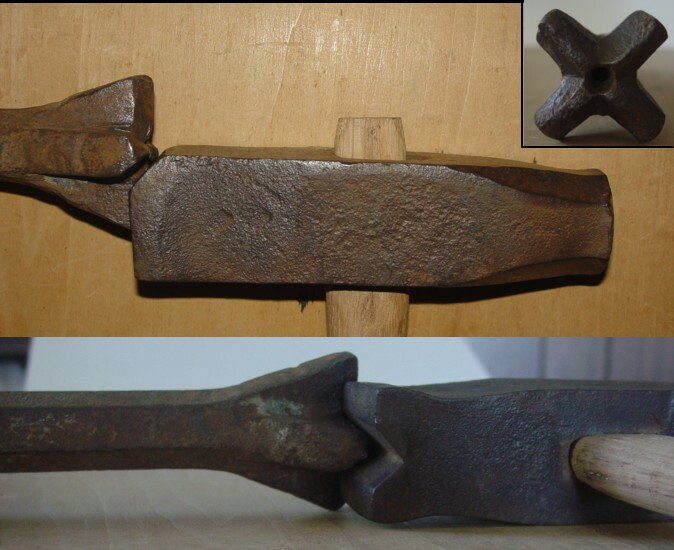 It seems to be some 'real' tool that was mass produced for a purpose vs some one-off blacksmith custom made tool. But so far, I've had no luck in figuring out what the purpose was. It looks like it was for pointing rock drills (which was what 3 different people had suggested) - but it was for pointing one "blade" at a time. But that style pointed all the blades at once instead of being used to shape one blade at at time. I guess the advantage of having a tool that did one blade was that it could be used on a wider range of drill bit sizes - especially very large drill bits? Yeah, I know about that guy, and was trying to figure out how to contact him to ask him about this (and another really odd tool I picked up last year). Anybody ever used these notebooks for SolidWorks? Press Fit Pulley - Steel or Aluminum? What are Riffler Blades Used For ?